Empirical Bayesian kriging (EBK) is a geostatistical interpolation method that automates the most difficult aspects of building a valid kriging model. 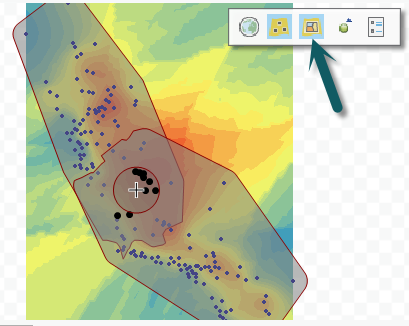 Other kriging methods in Geostatistical Analyst require you to manually adjust parameters to receive accurate results, but EBK automatically calculates these parameters through a process of subsetting and simulations. Empirical Bayesian kriging also differs from other kriging methods by accounting for the error introduced by estimating the underlying semivariogram. Other kriging methods calculate the semivariogram from known data locations and use this single semivariogram to make predictions at unknown locations; this process implicitly assumes that the estimated semivariogram is the true semivariogram for the interpolation region. By not taking the uncertainty of semivariogram estimation into account, other kriging methods underestimate the standard errors of prediction. Empirical Bayesian kriging is offered in the Geostatistical Wizard and as a geoprocessing tool. Standard errors of prediction are more accurate than other kriging methods. Allows accurate predictions of moderately nonstationary data. More accurate than other kriging methods for small datasets. Processing time rapidly increases as the number of input points, the subset size, or the overlap factor increase. Applying a transformation will also increase processing time, particularly if K-Bessel or K-Bessel Detrended is chosen for the semivariogram model type. These parameters are described in subsequent sections of this topic. Processing is slower than other kriging methods, especially when outputting to raster. Cokriging and anisotropic corrections are unavailable. The Log Empirical transformation is particularly sensitive to outliers. If you use this transformation with data that contains outliers, you may receive predictions that are orders of magnitude larger or smaller than the values of your input points. This parameter is described in the Transformations section below. A semivariogram is estimated from the data in the subset. Using this semivariogram as a model, new data is unconditionally simulated at each of the input locations in the subset. A new semivariogram is estimated from the simulated data. Steps 2 and 3 are repeated a specified number of times. In each repetition, the semivariogram estimated in step 1 is used to simulate a new set of data at the input locations, and the simulated data is used to estimate a new semivariogram. This process creates a large number of semivariograms for each subset, and when they are plotted together, the result is a distribution of semivariograms that are shaded by density (the darker the blue color, the more semivariograms pass through that region). 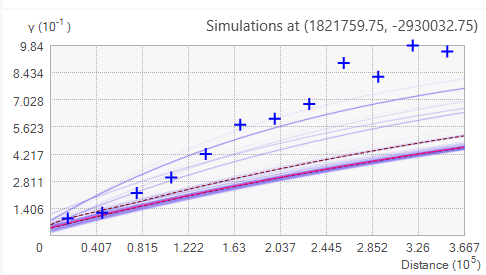 The empirical semivariances are represented by blue crosses. In addition, the median of the distribution is colored with a solid red line, and the 25th and 75th percentiles are colored with red dashed lines, as shown below. The number of simulated semivariograms per subset is defaulted to 100, and each of these semivariograms is an estimate of the true semivariogram for the subset. For each prediction location, the prediction is calculated using a new semivariogram distribution that is generated by a likelihood-based sampling of individual semivariograms from the semivariogram spectrums in the point's neighborhood. For example, if a prediction location has neighbors in three different subsets (as specified by the searching neighborhood), the prediction will be calculated using some simulated semivariograms from each of the three subsets; these semivariograms are chosen probabilistically based on their likelihood values. Empirical Bayesian kriging differs from other kriging methods in Geostatistical Analyst by using an intrinsic random function as the kriging model. Other kriging models assume that the process follows an overall mean (or specified trend) with individual variations around this mean. Large deviations are pulled back toward the mean, so values never deviate too far. However, EBK does not assume a tendency toward an overall mean, so large deviations are just as likely to get larger as they are to get smaller. Hence, intrinsic random functions inherently correct for trends in the data. The Nugget and b (slope) must be positive, and α (power) must be between 0.25 and 1.75. Under these restrictions, the parameters are estimated using REML. These semivariogram models do not have a range or sill parameter because the functions have no upper bound. By clicking a different location on the preview surface, the semivariogram distribution and the distributions of the semivariogram parameters are displayed for the new location. If the distributions do not significantly change across the data domain, this suggests that the data is globally stationary. The distributions should change smoothly across the data domain; however, if you see large changes in the distributions over small distances, increasing the value for Overlap Factor can smooth the transitions of the distributions. As described in the Transformations section below, applying a transformation changes the kriging model from an intrinsic random function to a simple kriging model, and several additional semivariogram models become available. Empirical Bayesian kriging offers the multiplicative skewing normal score transformation with the choice of two base distributions: Empirical and Log Empirical. The Log Empirical transformation requires all data values to be positive, and it will guarantee that all predictions will be positive. This is appropriate for data such as rainfall that cannot be negative. If a transformation is applied, a simple kriging model is used instead of an intrinsic random function. Because of these changes, the parameter distributions change to Nugget, Partial Sill, and Range. 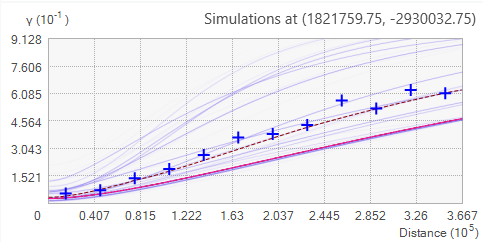 If K-Bessel or K-Bessel Detrended is chosen for the Semivariogram Type, an additional graph for the Shape parameter in K-Bessel will be displayed. 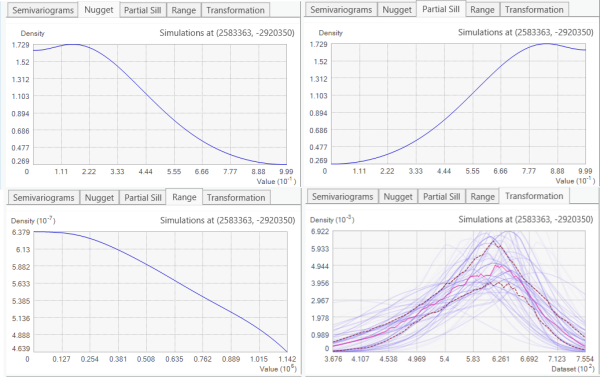 An additional Transformation tab also appears that displays the distribution of the fitted transformations (one for each simulation). As with the Semivariograms tab, the transformation distribution is colored by density, and quantile lines are provided. All geostatistical methods assume spatial autocorrelation, that closer things are more similar than things that are farther away, and the semivariogram defines how this similarity diminishes over distance. Some semivariograms (Exponential, for example) assume that the similarity diminishes quickly. The Whittle semivariogram model, on the other hand, assumes the similarity diminishes slowly. 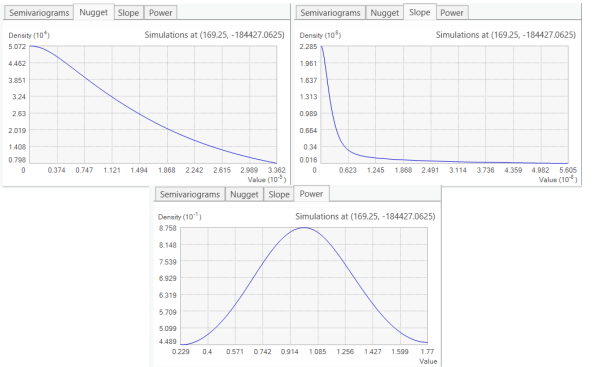 Even with the same nugget, range, and sill, these two semivariograms will define diminishing similarity in starkly different ways. The key to getting reliable results is to choose the semivariogram that most closely matches how your phenomenon behaves. The semivariogram models available for you depend on your choice of transformation. The three detrended semivariogram models are the same as their nondetrended counterparts, except that a first-order trend removal will be applied. Removing trend has a negligible effect on calculation speed. Advantages: Relatively fast and flexible. Generally a safe choice that balances performance and accuracy. Disadvantages: Less flexible and slower than other choices. Advantages: Very fast. Works best when strong trends are present. Disadvantages: Less flexible, particularly when no trend is present. Advantages: Offers a flexible transformation. Faster than K-Bessel and K-Bessel Detrended. Disadvantages: Shape of the semivariogram is not flexible. Slow compared to Power, Linear, and Thin Plate Spline. Advantages: Offers a flexible transformation. Faster than K-Bessel and K-Bessel Detrended. Removes first order trend. Advantages: Most flexible and accurate. Disadvantages: Takes the longest to calculate. Advantages: Most flexible and accurate. Removes first order trend. If you are willing to wait to get the most accurate results, K-Bessel or K-Bessel Detrended should be chosen. The presence or absence of trend should determine which one. If you need results quickly and are willing to sacrifice some accuracy, Linear or Thin Plate Spline should be chosen. If there is no trend or the trend is weak, Linear is a better choice. If you need a balance of accuracy and speed, Power is a good choice. If a transformation is required, but you cannot afford to wait a long time for output, Exponential or Whittle (or their detrended counterparts) should be chosen. You should choose the one that best matches the empirical semivariances in the Geostatistical Wizard (described below). Crossvalidation should also be taken into account. Empirical semivariances do not fall in the middle of the spectrum. Empirical semivariances fall in the middle of the spectrum. If your input data is in a geographic coordinate system, distances will be calculated using chordal distance. The chordal distance between any two points is the straight-line distance that connects the two points. This line will go through the earth rather than along its surface. To visualize this, imagine shining a flashlight through a transparent sphere. The length of the beam of light between the point where the light enters and exits the sphere is the chordal distance between these two points. The primary benefit of using chordal distance over geodesic distance is that it is less computationally intensive. Additionally, there is only limited theory about performing kriging on spheroids. Previous versions of ArcGIS treated geographic coordinates as square coordinates and calculated the Euclidean distance between the points. However, a one degree by one degree cell is not actually a square, so this distance will be distorted. This distortion gets worse as you move further north or south from the equator. Maximum number of points in each local model—Specifies the number of points in each subset. The larger the subset size, the longer EBK will take to calculate. Local model area overlap factor—Specifies the degree of overlap between subsets. Each input point can fall into several subsets, and the overlap factor specifies the average number of subsets that each point will fall into. For example, an overlap factor of 1.5 means that about half the points will be used in one subset and half will be used in two subsets. A higher value for the overlap factor makes the output surface smoother, but it also increases processing time. Number of simulated semivariograms—Specifies the number of semivariograms that will be simulated for each subset. More simulations will cause the predictions to be more precise, but processing time will also increase. Chilès, J-P., and P. Delfiner (1999). Chapter 4 of Geostatistics: Modeling Spatial Uncertainty. New York: John Wiley & Sons, Inc.
Krivoruchko K. (2012). "Empirical Bayesian Kriging," ArcUser Fall 2012. Krivoruchko K. (2012). "Modeling Contamination Using Empirical Bayesian Kriging," ArcUser Fall 2012. Krivoruchko K. and Gribov A. (2014). "Pragmatic Bayesian kriging for non-stationary and moderately non-Gaussian data," Mathematics of Planet Earth. Proceedings of the 15th Annual Conference of the International Association for Mathematical Geosciences, Springer 2014, pp. 61-64. Pilz, J., and G. Spöck (2007). "Why Do We Need and How Should We Implement Bayesian Kriging Methods," Stochastic Environmental Research and Risk Assessment 22 (5):621–632. 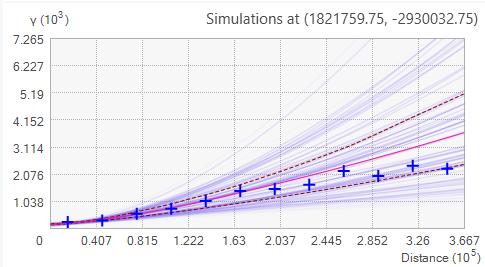 What is EBK Regression Prediction? What is Empirical Bayesian Kriging 3D?